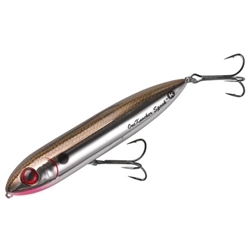 The Heddon One Knocker Spook thumps bass with a sound like no other topwater bait. The single tungsten rattle contained in a sound intensifying chamber produces a loud "thump" with every twitch that draws fish from long distances. Its positioning within the body of the lure makes walking-the-dog easier than ever.